If you live outside of Japan and you want to buy something from Yahoo Auctions then this service is for you. We specialise in car parts, but we can buy almost anything on Yahoo Auctions. The reason this service was started is because Japanese sellers on Yahoo Auctions almost always refuse to send overseas. Secondly, they quite often cannot speak English well enough to complete a business transaction like dealing with a foreign buyer. In fact, most sellers cannot speak English at all. The transaction needs to be completed in Japanese and we have Japanese staff that communicate with the seller to ensure a smooth process. Lastly, most sellers cannot receive payments from foreign buyers as they require payments in Japanese Yen. They do not accept Paypal or international bank transfers. Can you buy from other sites besides Yahoo Auctions? Yes, we can. We can buy from almost any website in Japan. Some of the sites we regularly buy from are Amazon, Rakuten, Up Garage, I-parts, and Goo Parts. Please contact us if you would like to buy from one of those sites. I bought something on Yahoo Auctions with my own account. Can you help me get the item? Unfortunately we cannot. We need to bid using our own Yahoo Auctions accounts. If the bid was not placed with our account, we cannot assist you with dealing with the seller, and sending the item etc. I bought something through another freight forwarder and they won’t send the item. Can you help me? Unfortunately we cannot. As the item was not bid on with one of our Yahoo Auction accounts, we cannot help you with that item. Our commission is 10% of the item cost up to 35,000 yen. 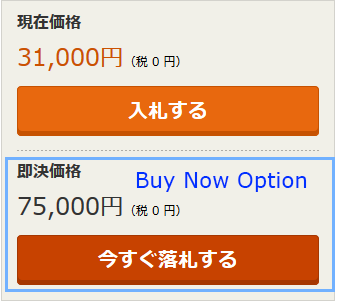 Between 35,000 yen and 50,000 yen, our commission is a flat rate of 3,500 yen. From 50,000 yen, it is 7%. There is a minimum commission of 1,000 yen. Wheels (sets of 4) 16 inches or larger have a minimum commission of 2,000 yen. Yes. Usually you will have to pay the bank transfer fee that we are charged to pay the seller. You will also most likely have to pay domestic shipping from the seller to our warehouse as well. That is if the seller does not offer free domestic shipping. The shipping cost is usually listed in the auction. Will you send the item to an address in Japan? Unfortunately we cannot send items domestically. We had a number of issues in the past where we have sent to hotels or someone’s house, and the package has been returned to us. There is a very high failure rate so for this reason we do not send to Japanese addresses. This includes sending to other companies like container shipping yards and the like. DHL International Express – The fastest shipping method. Usually takes 2-4 days to most places in the world. Depending on what you are sending, they are the most expensive. They charge based on cubic weight so sending small heavy things like clutches is more cost effective than sending large light items like aero parts. DHL provide online tracking and full shipping insurance. TNT International Economy Express – A little slower than DHL, but also a little cheaper to certain countries. Packages usually take 3-7 days to most places in the world. TNT provide online tracking and full shipping insurance. Japan Post EMS – 3-7 days to most places in the world. They will be delivered by your local post office. EMS is based on weight so often works out cheaper for sending larger, lighter items. EMS does have a maximum length limit of 150cm. EMS comes with online tracking and full shipping insurance. Japan Post SAL – Packages can take from 7 to 21 days. Like EMS, they are also delivered by your local post office. The shipping time is a little bit longer, however the cost is usually cheaper so if you are not in a hurry, then this can be a good option to save some money. SAL comes with online tracking, but only has limited insurance. Japan Post Sea Mail – Packages usually take about 6 to 12 weeks. Like EMS and SAL, they are delivered by your local post office. Sea Mail is the most cost effective option, but comes with a few caveats. It is slower than EMS and SAL. Many countries also have smaller maximum size limits than EMS so not everything can be sent by sea post. Sea Mail does with online tracking, but cannot be tracked while it is on the water. This means that for most of the journey you will not get online updates. Sea Mail, like SAL, also only has limited insurance. For more information on Japan Post’s services, please see the Japan Post website. Do I have to pick up the items from a port? No. The shipping companies we use deliver to your door. If you are not home, then you may have to pick up the item at your local post office/shipping company office. Do you send items using shipping containers? No, we do not deal with shipping containers. If you need your items sent by shipping containers, please contact a specialist container shipping company for that service. We cannot send from our warehouse to your shipping container company’s yard either. What items can you not send? Engines – Engines require special export approval. We cannot obtain that for you so that means we cannot send engine. Bumpers – Bumpers are very expensive to send and often cause a lot of issues. For these reasons, we decided it was not viable to deal with bumpers. Flammable/dangerous items – Shipping companies will not accept most flammable/dangerous items so please check with us if there is something you would like to send that you are unsure about. Can you bid in increments up to my maximum bid? A Yahoo auction for some wheels. Your maximum bid is 40,000 yen. The current highest bid is 25,000 yen. We enter your maximum bid of 40,000 yen. If the previous highest bidder set a maximum bid limit of 25,000 yen, then we would then be the current winning at 25,500 yen. If the previous highest bidder had set a maximum bid of 34,500 yen, then we would become the highest bidder at 35,000 yen. 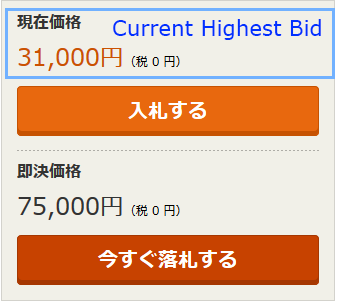 Our bid will stay at 35,000 yen until either a) the auction finishes, or b) someone bids against us. Can you give me a shipping quote including all fees? Please note that our shipping quotes are only an estimate. We try to guess the weight of the item as best as we can based on experience, however it is not always accurate. Also, some sellers do not specify domestic shipping costs, so sometimes we have to estimate these too. We try to be as accurate as possible but we cannot be held responsible if the cost is different from our quote. If you know the weight of the item, then please let us know and we can quote based on that too. Can you combine items to save on shipping costs? Yes, we can combine items together to save on shipping. Please note that shipping cost is usually based on weight, so adding items to the package increases the cost of shipping. Items that can combine well to save on shipping costs are small items that are not fragile. Items that do not combine well are items like headlights and say coil overs. If you need help with working out what may or may not combine, please ask us. If you buy multiple items from the same seller within 1 week, we will combine the commission on them so it will save you some money. For example, 5 x 500 yen items from different sellers would incur the 1,000 yen minimum commission per item. That would be 5,000 yen commission. However, if you order 5 x 500 yen items from the same seller, then the item total would be 2,500 yen and you would only be charged 1,000 yen commission. Furthermore, many sellers will combine domestic shipping so that will save your some more money there so please keep that in mind when if you are ordering multiple items under 1,000 yen. I want to buy some wheels. Can you remove the tyres to save on shipping costs? Yes, we can. We charge 1,000 yen per tyre to take them off and dispose of them. This will usually save you hundreds of dollars in international shipping so most customer elect to use this service. I’m looking for something specific. Will you search for it for me? We run on a very small commission so we cannot actively search for items for you. If there is something you are looking for, and you need help searching in Japanese, we can do that for you. If you tell us what you would like to search the auctions for, then we can send you pre-filled out Yahoo Auctions search links that contain the Japanese search terms for those item(s). It is up to you to then search through the results and find what you are after. I can’t read Japanese. Can you help me? Sure. The first thing you should do is run the item through translation service like Google Translate and get the general idea of the product. Once you have done that, if you have any specific questions, then send the link through to us and we can answer those questions for you. I want to ask the seller a question. Can you help me with that? Yes, we can post a question on your behalf. If you send us the question in English, we can translate it and forward it on to the seller. Please note that sometimes sellers do not respond to questions. This is especially true for large online sellers. Well, that is completely up to you. What do you think the item is worth? You need to think about that, and then come up with a bid amount that you are happy with. If the item is rare and sought after, the bid will need to be high. You need to take the condition in to account too. Be sure to think well about it, and if you end up being outbid, you can walk away knowing you weren’t prepared to pay that much. Can I make an offer to the seller? Making offers to sellers on Yahoo Auctions is generally frowned upon. Generally, if the seller wants a set price, they will set the “buy now” option in the auction. If there is no buy now option, then they will very rarely accept an offer. Low ball offers usually get no response and can often lead to our account being blacklisted by the seller. Many Japanese sellers would rather throw the item away and get no money at all for it, than accept a low ball offer. So please understand that if you request a low ball offer, we may not put it to the seller. The only time we will put a low ball offer to the seller is if they have specifically said they will accept offers. How do I see the current highest bid? Is there a “buy now” option like eBay? Some sellers do list items with a buy now options. It is always more expensive that the bid amount, but it means you are guaranteed winning the auction so then you don’t have to worry about being outbid. If you really need the item, then this is often the best way to go. Are there scams on Yahoo Auctions like there are on other auction sites like eBay? Yes, unfortunately there are scams on Yahoo Auctions. While there are not as many as other sites, they definitely do still exist. Common scams are putting photos of multiple items, but writing that the price in for only 1 of them in the description or selling fake items like Nardi steering wheels. We do try out best to warn if we think the item is suspicious, but we cannot catch everything unfortunately. If you are unsure about anything in the auction, please ask before requesting a bid. I am ready to bid. What now? Please make sure you have read everything above. Once you had decided your maximum bid, send us the link(s) along with the maximum bids (in Japanese Yen) you would like to place on each auction, and we can place those bids for you. If you do not have any existing credit with us, we will send you a deposit request for the amount of those bids. Why do I need to send you a deposit before bidding? When we bid on an auction, we are entering in to a contract with the seller that we will agree to pay for that bid if we win. For this reason, we need to get a deposit from you. If our bid is successful, then we need to pay the seller as soon as the auction finishes. The quickest and easiest way to pay is via PayPal. Paypal does charge fees that we have to pass on to you as well, so please be aware of that. Australian customers can do a direct deposit (via Internet or in branch) in to our NAB account. If you would like to use that option, please ask. Furthermore, we do accept international wire transfers in to our Japanese bank account, however Japanese banks charge 4,000 yen to receive international transfers, so we will have to pass that cost on to you as well. International wire transfers are usually only worth it when transferring large deposits over a few hundred thousand yen. No. Once bids are placed, we cannot cancel them. This is why we ask for a deposit up front to make sure you are committed to the bid. If my bid is not successful, will my deposit be refunded? Yes. We only ask for a deposit for if we win the auction. If your bid was not successful, then please send us an email and we can refund your deposit. If you paid by AUD in to our Australian bank account, please be sure to include your bank details in that email. Refunds cannot be processed until after the auction finishes as sellers can cancel the highest bidder and we may end up winning. We do not take any fees/commission if you do not win the auction. What happens if I win the item for less than my deposit amount? We will credit the deposit towards the final bill which includes domestic shipping, international shipping, our commission and so on. The item cost will be what we won the item for, not what your maximum bid was. If your maximum bid was 30,000 yen and you won the item for 25,000 yen, then your final bill will be for 25,000 yen plus shipping/commission etc. If your deposit was large enough to cover all the shipping/fees etc, then we will refund anything left over at the end. How long does it usually take to receive my final bill after winning the auction? That can depend on a number of things. We contact the seller once the auction finishes and pay them. Then they need to send the item to us. Once it arrives at our warehouse, it is placed in the packing queue (unless you want to combine and we are waiting for other items) to be packed/weighed up for shipping. It generally takes about 1 week from the end of the auction, but has been known to take longer as some sellers have jobs where they cannot easily get to the post office etc. Can I pay the full quote amount up front? We only ask for the bid amount up front as our quotes are only an estimate. We cannot guarantee that the items weighs what we have estimated so that is why we charge the shipping later. We only charge you what it costs based on the exact weight/size of the item so we cannot be accurate with that until we have the item in our warehouse. If we are out by a few 100 grams or a few centimetres, it can effect shipping costs. Do you have somewhere I can check on my bid/order status? Yes, we can set you up with an online customer portal. You can check on your current bids as well as previous bids and any orders in progress. If you would like access to that site, please send us an email. I have received my final bill. What now? Please follow the instructions in the bill. If there is an issue with the bill like for example if you want to change shipping method, or you think the credit applied is not correct, then please do not pay the bill. Please contact us and we will sort it out for you. If everything is fine in the bill, then please pay it. Once you payment clears, we will send your package. So it is important to not pay the bill unless everything looks correct to you. I am worried about import tax/customs duties. Can you help with this? Please contact us and we will try our best to assist you. I received my item but it is damaged or not what I ordered. What can I do? Can I call you if I have any more questions? Unfortunately we do not take phone calls from customers. The first issue is the time difference. We are based in Osaka, Japan, so our business hours are the middle of the night for many countries. Secondly, we operate on a minimal commission to help you get what you need at a good price. If we were to spend 20 minutes on the phone to you, then that means we could only deal with about 3 customers per hour. We simply cannot do that on our margins so that is why we need all contact to be via email. Contacting by email also has other advantages like having a paper trail for all bids/questions, as well being able to respond to customer in order of when they contact us. This makes it fair for everybody.